Easy 20-minute salmon recipe with minimal preparation. Rinse salmon then pat dry. Make a few shallow, angled cuts in salmon about 1 in. apart. Spread Earth Balance on salmon as much as possible but any clumps will melt later. Combine pesto, garlic, and olive oil in small bowl. Spread pesto mix generously on salmon, creating a nice, even layer. Place a long piece of foil (about double the length of the salmon) on a jelly pan or in a rectangular raised dish. Drizzle olive oil on center area of foil and place prepared salmon on it. Season with garlic salt (I prefer Lawry’s) to taste. Make a loose steaming pouch by folding the foil’s edges toward the middle and pressing together. Try to gently close the opening on the sides as well. Wash asparagus spears and shake dry. About 1 to 1-1/2 inches from the base, bend the spear until it snaps. Discard ends. Place spears on foil-lined jelly pan, closely but not touching. Drizzle olive oil on spears then season with salt and pepper. Place salmon dish and asparagus-filled pan in oven. After 12 minutes, poke asparagus. If the fork goes in easily, remove asparagus from oven and set aside. After another 3 minutes (15 min. total), take out salmon. Unfold foil so salmon is uncovered. Then, broil salmon for 5-7 minutes to add a light crispiness to the top. Optional: Use lemon juice and/or dill to add more flavor to salmon. I love salmon, pesto, and asparagus! So this is so up my alley! I’m not a big fan of salmon but it does look delicious. That looks so yummy- and healthy too! Perfect on busy days right after I get home from work. 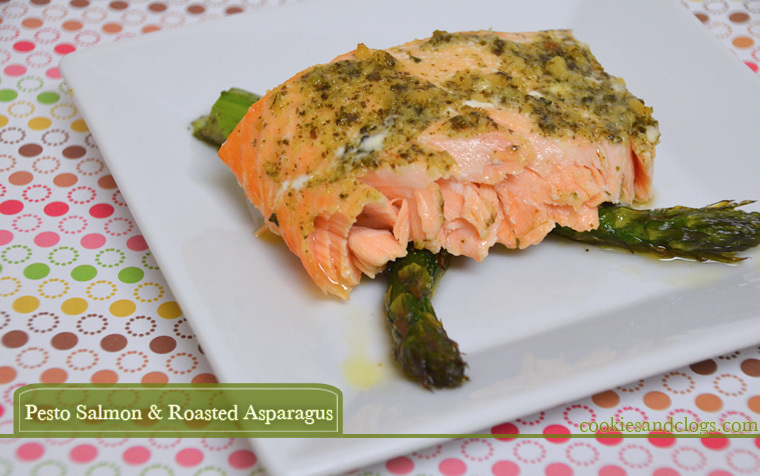 I love salmon and asparagus, I must make this! looks amazing and so going to try it. That looks delicious! I am a big salmon fan but hardly ever cook it because it’s so hard to find wild caught in our stores in Florida! Two of my favorite things: salmon and asparagus. I’m not a seafood person, but this might be one for the boyfriend! This looks so light and delicious! Wow! This pesto salmon looks great and it is healthy too. Certainly need to try this out. This is nice because it actually covers the fishy-type taste. We love Salmon in my house! And asparagus is coming up in ranks as being good for me. It was. I still have half of it in the freezer for one of those nights I’m dreading cooking. This looks amazing I love asparagus when it is cooked right. Haha, funny you say that because I overcooked it there! It’s so easy to over/undercook Asparagus but we like it when it’s firm but not too crunchy. I need to get over my fear of cooking Salmon!! This looks great! Haha, it is kind of gushy but you can pretty much do this without having to touch it much – just keep some tongs handy! I love both of these. Pinned for later! Ooo this may be something worth trying to cook for dinner!